Although I have been vegetarian for over 20 years now, there isn’t any profound moral, political, or ethical reason behind it. I’m a vegetarian because I’m a picky eater, and the thing I’m picky about is meat. I plain old just don’t want to eat it. People ask me all the time if I miss meat or if it’s hard being vegetarian and the answer is no. But I’ll tell you, I do have burger envy. Straight up. Don’t get me wrong, I enjoy veggie burgers, but more often than not I don’t eat them in a bun. Most veggie burgers are held together with bread crumbs or rice or potatoes, so it seems kind of crazy to me to slap that breadiness in the middle of more bread. Is it just me? What I want in a burger is a slab of protein, a load of veggies, probably some cheese, and a nice toasted bun. Is that too much to ask? Not long ago I was experimenting with a lentil burger, and I decided to try replacing the breadcrumbs with chickpea flour to try and avoid said breadiness. The burger was nothing to write home about, but it got the wheels turning. Could I make a burger patty out of chickpea flour? Yes, yes I could. It’s called panisse. Chickpea fries have a nuttier, slightly more complex flavour than polenta fries do, and are definitely more nutrition rich. We like ours served with a chipotle dip, which is nothing more than Greek yoghurt, chipotle peppers, and a bit of salt all whisked together. 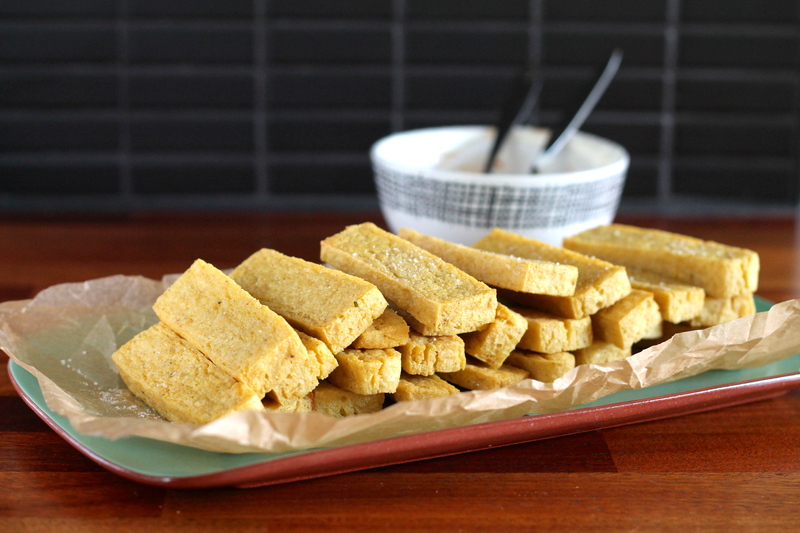 So, chickpea patties, or chickpea fries. Panisse, two ways! Other things to do with panisse? I haven’t tried it, but I’m willing to bet that grilled panisse would be pretty good. Or cut into little squares for panisse croutons? Give it a try! This recipe makes quite a lot of panisse. I got 4 burger patties (the one above I sliced in half because it’s quite thick and I wanted to maximize on crispy edges) and two batches of chickpea fries (for two people) out of this quantity. The panisse freezes well, so I simply sliced it into large squares and froze separated by parchment paper. That way I’ve got panisse on hand in the freezer and I’m a simple slice and bake away from chickpea fries or a chickpea burger patty any time I want. If you don’t want to end up with quite so much, I suggest you reduce the recipe by 1/3. Generously butter or oil a 9 x 11 baking sheet and set aside. In a large pot, bring the water to the boil over medium-high heat. Once the water is boiling, reduce the heat to medium and whisk in the chickpea flour all at once. Continue whisking for about 10 minutes, until the mixture is thick and smooth (I find that a few lumps are unavoidable, but you won’t notice them later). Stir in the olive oil and a bit of salt and pepper to taste. Pour the chickpea mixture into the greased baking sheet and spread out into an even layer. Once it has cooled slightly, cover with plastic wrap and refrigerate for at least 1 hour, or overnight. Pre-heat your oven to 400F / 200C (this is a good place for your convection fan, if you’ve got one). Line a large baking sheet with parchment paper or a silpat. Slice the firm batter into sticks for chickpea fries, or larger squares for burger or sandwich patties. Line them up on the baking sheet, and brush with a bit of olive oil or melted butter. Bake for 10 minutes, then turn to the other side, brush again, and replace in the oven to bake for another 10 minutes. They should be slightly golden and crispy on the outside. Remove from the oven, salt generously, and serve with dip (for fries) or assemble your burger. Chickpeas are a super food! They’re a very good source of folate, protein, dietary fiber, phosphorus and iron. The fiber in chickpeas is mostly insoluble, which is really good for our digestive tracts. You can read more about the health benefits of eating chickpeas here. 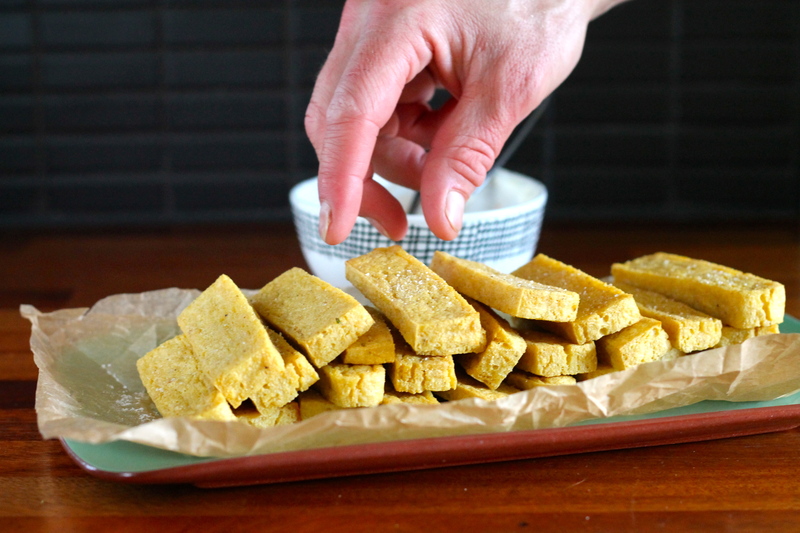 I love polenta fries but I’ve never thought of doing the same with chickpea before – what an excellent idea! Thanks Kathryn! They’re really excellent! A much more complex flavour, and so much more nutrition packed in. Great pictures. Never heard of chickpea fries before. I feel the same way about meat. I never wanted to eat it when I was a kid because the texture just squicked me out. People never believe me when I tell them I have no desire to eat meat, but it’s absolutely true. I only recently learned about the miracle of chickpea fries and now I’m definitely going to have to try making a burger out of them! I probably prefer the fries to the burger, but both are really good! It’s an interesting take on a burger, and I can think of lots of other things to do with it as well. I hope you try it out! Have you tried adding sunflower, pumpkin, flax, or sesame seeds (or a mixture)? 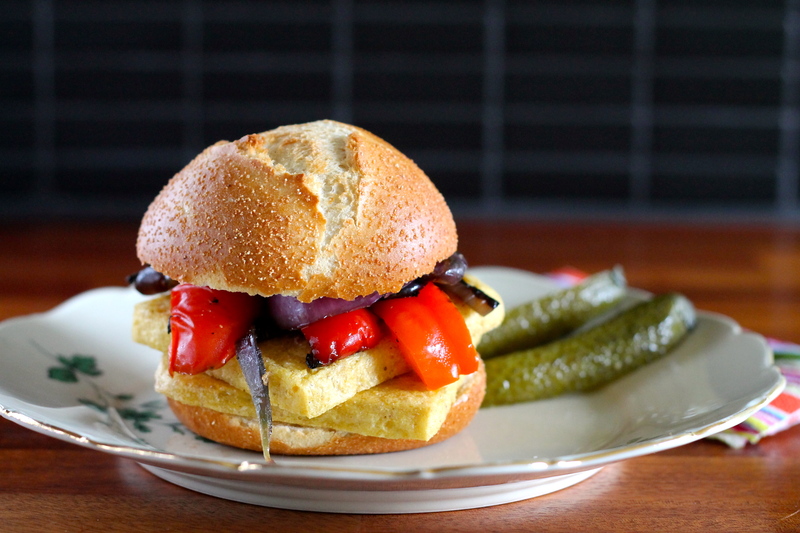 It adds the texture that straight chickpea flour lacks and that you want in a burger. What I do is add the seeds just at the end of the boiling process, just before pouring the chickpea batter out to cool. Ooooh, that’s a great idea! Thanks for the tip! AMEN on the breadiness!! I feel exactly the same, and burgers are one of the very few meats I miss. I’ll have to try both these panisses, and an added bonus is that they both seem like they’d appeal to the toddler crowd. I bet you could make little panisse nuggets for the toddler. Hand held, dippable, and tasty. Total win! I love your burger. They look so yummy! I’ll try to make it for my family some time. Thanks for the recipe! Thanks! Give it a try and let me know how your family likes it!